1 October 2016 – Dig Delve – An online magazine about gardens, landscape, growing & making. A new month today and there is a chill in the air and the grass is heavy with dew. The trees are yet to show colour, but the autumn bulbs are up and pushing a flare of brilliance against the drawing back that is happening around them. Today’s posy, the first of October, captures some of this late vibrancy. 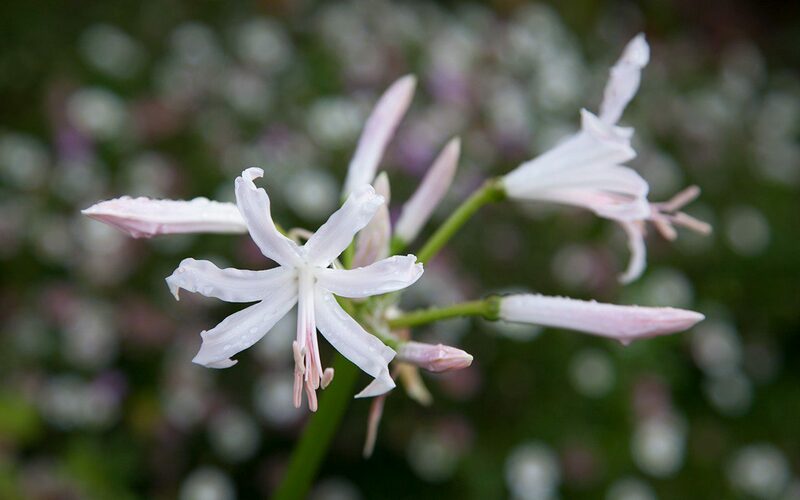 I have known and grown Nerine bowdenii since I was a teenager. Geraldine, our neighbour, had them growing in the root zone of a huge fig at the foot of a south-facing wall. The fig had long outgrown any ambitions to be trained, but its lofty frame allowed you to walk underneath it and the sun to slide in and bake the ground at its feet. A good baking is what Nerine like as it makes them feel like they are not so far from their origins in the Drakensburg Mountains of South Africa. They grow there in rocky ground and, though they are capable of surviving a -15°c chill, a free-draining soil and reflected heat will help them to flower better here in Britain. I have a collection of plants gathered from here and there as I have come across good forms. The best – the pure white ‘Blanca Perla’ and palest shell pink ‘Ostara’ – are kept in pots and brought up to the side door to keep us company when they are in flower. A mixed batch, which I bought unnamed and which range from white through to a hot sugary bubble-gum pink, are planted at the base of my espaliered pears in the Kitchen Garden. They get the benefit of a south-facing position, the radiated heat from the wall and, importantly, an absence of competition. Their foliage, which needs all the light it can get, hates to be overshadowed by neighbours so keep them to the front of a sunny bed if you want to grow them in company. A row of Geraldine’s bulbs, which I have moved about with me from garden to garden over the years, are shortly to be transplanted to their new position from the stock beds. The best time to move them is immediately after they have finished flowering as their foliage is becoming dormant then. I will move entire clumps and not divide them, as they flower best when in a tight community. Established clumps will tell you how they like to live, for the bulbs will mound up out of the ground to sunbathe rather than dwell below the surface as most bulbs do. I will plant the clumps on a hot, south-facing slope where the sun slides in under a limbed-up holly. Though there is the necessary light for baking the conditions are tougher there and the bulbs will put more energy into flower than leaf. The flowers rise up as the summer foliage is waning and sap the last of its strength in the process. Tall stems – sometimes as much as a couple of feet – stand alone by the time the flower sheaths split in response to the flowers’ swelling. They are in flower for weeks, from early in September in some years, running on well into November if the weather is kind. 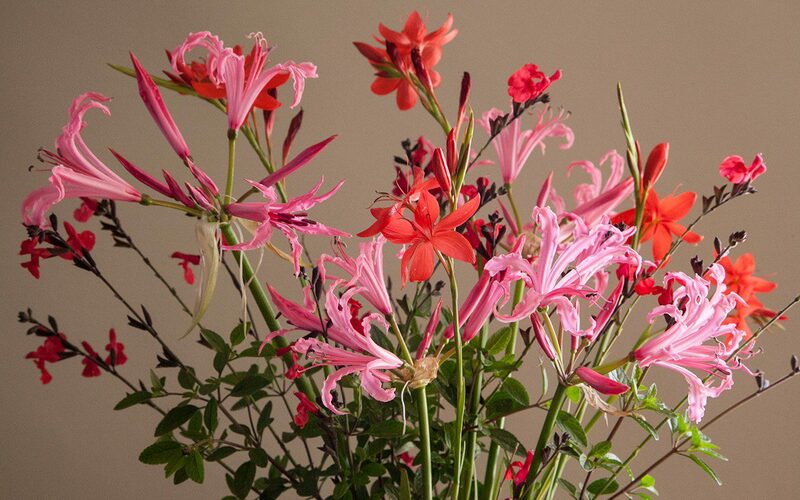 As cut flowers they can last a good fortnight in a vase. 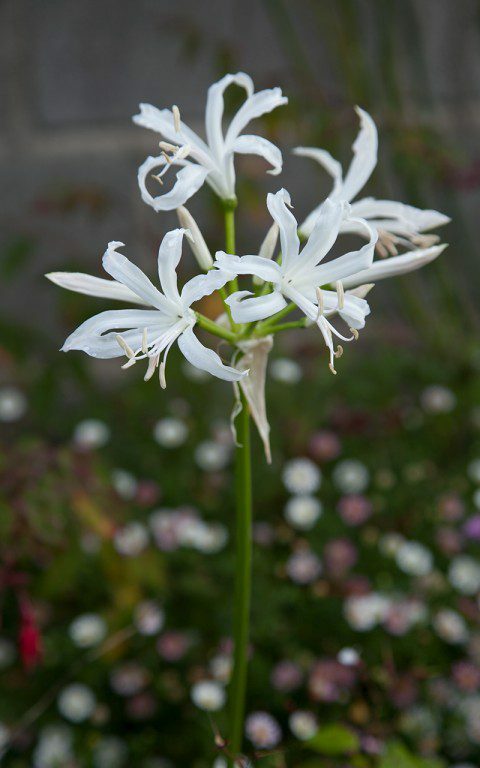 Schizostylis also hail from South Africa. 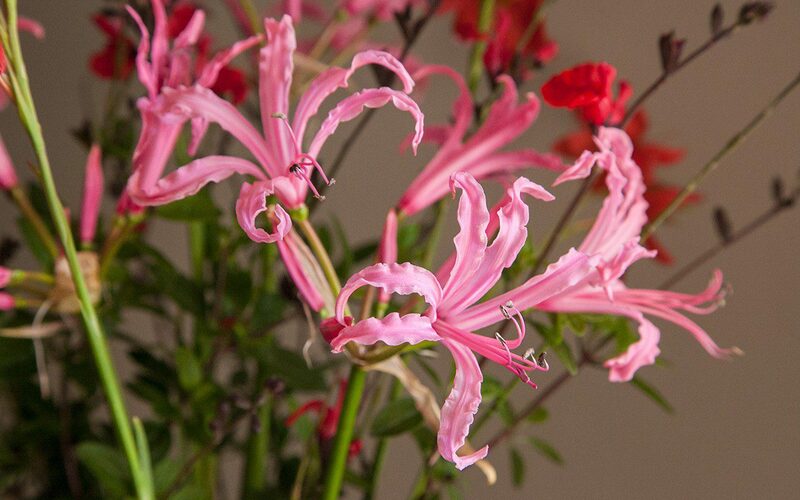 In contrast to Nerine their foliage is almost evergreen, but they also hate competition and will fail to flower if overshadowed. However, here the parallel ends. They prefer damp ground or certainly moisture-retentive soil, so the posy makes a combination that is good for colour contrast, but not really achievable in the garden. That said, I have them here on the south-facing slopes and the plants have not complained in our hearty loam. They were given to me as spring divisions by Josie and Rachel, our neighbours up the lane. They run through their garden in drifts, appearing with asters and colchicum. So far, in the four years I have grown them in one place they have not needed dividing, but everything points to the plants needing it soon and they let you know when with shy flowering. 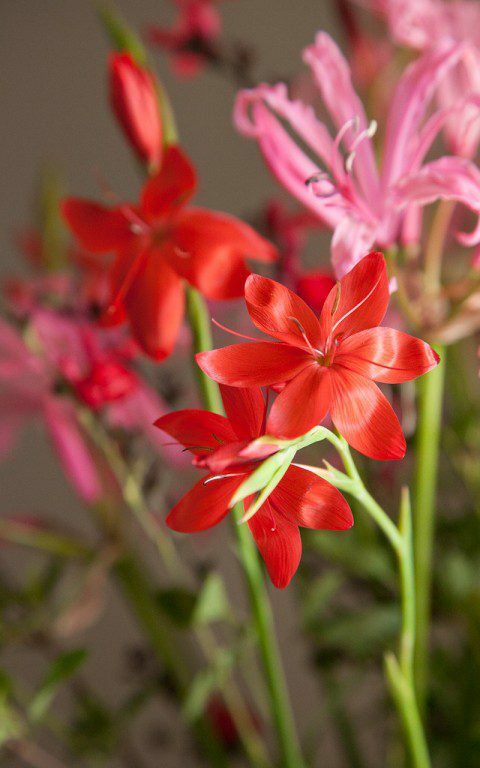 Schizostylis coccinea ‘Major’ is probably the best and most commonly available form. The satiny flowers are a gleaming brilliant red. In the past I have experimented with ‘Sunrise’, a soft apricot-pink, and have ‘Mrs. Hegarty’ – a pale shell pink – from the same neighbours, but both seem to be shy-flowering in comparison. I may simply have not found them a home that suits yet. My rule is that you have to move a plant at least three times to give it a chance of finding its niche, so I’m holding on final judgement for the moment. The Salvia ‘Jezebel’ is part of a salvia trial I’m running to find the good forms of Salvia greggii and it’s closely related cousins. The plants were selected from Dyson’s Nurseries three years ago now at the Dixter Plant Fair (running this weekend) and the best have proved themselves already. Bushy by nature and happy to live in your hottest, driest position, I have found they are excellent in pots or for prolonging the flowering period of a woody herb or mediterranean combination. ‘Jezebel’ has outgrown her neighbours, rising up to 90cm over the summer and flowering continuously since July. If you brush against them the sticky foliage and bronze calyces smell of blackcurrants and spice. 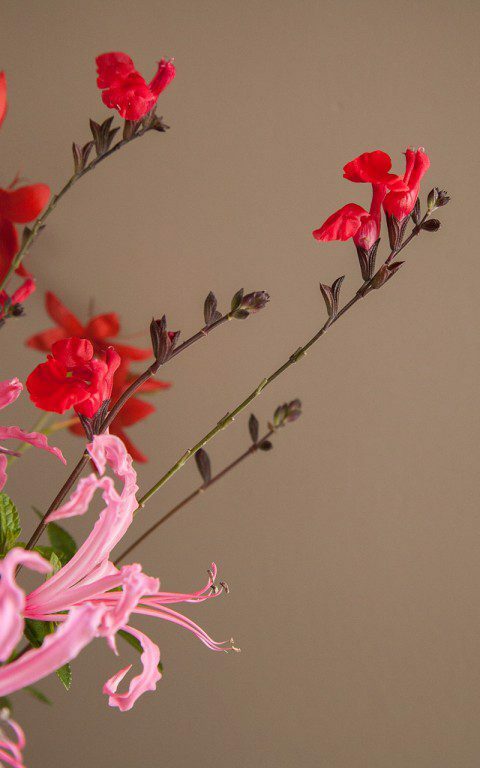 The flowers age from a vivid cherry-red to a slightly softer pink before they fall. The bees love it and I know already that it’s a keeper.